Germany's Dax steadied after a sharp fall earlier in the trading day. Bruised world markets paused in their rush lower Tuesday as U.S. corporate news gave Wall Street some respite. Stocks in Asia and Europe suffered another battering early in the day, led lower by Japan as markets took fright at weak manufacturing data that sent U.S. stocks plunging Monday. The modest U.S. rebound led to a mixed close in Europe. Germany's DAX -- the region's star performer last year -- was the hardest hit, falling as much as 1%, but other regional indexes eked out narrow gains. Japan's benchmark Nikkei index fell 4.2%, extending its tumble this year to just over 14%. The slide has put the index well into correction territory, and erased a big chunk of last year's stunning 57% gain. The sell-off in Japan has been fueled by the broader flight from stocks but also by a stronger yen -- seen as a relative safe haven. The currency has gained about 3.7% this year after hitting a five-year low in January. The Australia ASX All Ordinaries dropped 1.7% and Hong Kong's Hang Seng lost almost 3% as it too pushed into a correction. The slide on world markets followed hefty losses Monday for U.S. stocks. 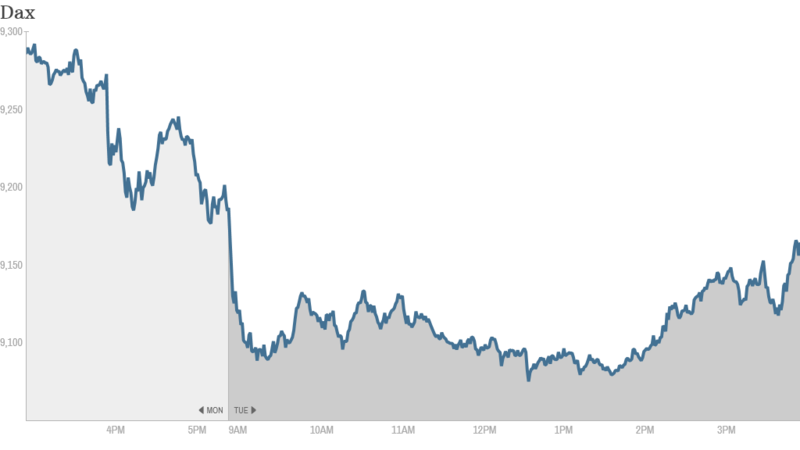 The Dow tumbled 326 points, or almost 2.1%, while the S&P 500 and Nasdaq were also down more than 2%. A much worse-than-expected reading on manufacturing activity in the U.S. was the main catalyst for investor discomfort on Monday. World markets -- particularly in developing economies -- have been volatile in recent weeks as concerns bubble over global economic health. Investors have been pulling out of emerging markets in anticipation of rising U.S. interest rates as the Federal Reserve scales back its bond buying. The bet is that higher rates and a stronger dollar will make emerging market investments far less attractive. Recent weeks have been marred by growing fragility in Turkey, India, Brazil, Indonesia and South Africa, as those countries have depended on foreign investment to finance imports. All are set to hold elections this year, promising months of political uncertainty and little impetus for reform. Weakness in China's important manufacturing sector has only added to worries. Emerging market stocks were weaker again Tuesday but some of the hardest hit currencies -- such as the Turkish lira and South African rand -- were looking more stable. Many emerging economies have benefited over the past few years as the Fed and other central banks have pumped money into the global economy. Investors yanked more than $6.3 billion from emerging market equity funds last week, the largest outflow on record in dollar terms, according to Boston-based fund tracker EPFR Global.